In 2008, a suspected outbreak of Rift Valley fever (RVF) was reported on a farm in the Bela-Bela area, Limpopo Province, South Africa. Seven calves died on the affected dairy farm, where no RVF vaccination programme was practised. No apparent clinical disease was reported in the other 300 cattle (33 calves included) or 200 sheep on the farm. During the outbreak, blood samples from 77.7% (233/300) of the cattle and 36.5% (73/200) of the sheep were collected on the affected farm and 55 blood samples were taken from cattle on a neighbouring farm. Eight weeks later, 78% of the cattle (234/300) and 42.5% of the sheep (85/200) were bled on the affected farm only. All sera were tested by an Immunoglobulin M (IgM)-capture Enzyme-linked immunosorbent assay (ELISA) and by an indirect Immunoglobulin G (IgG) ELISA. Selected IgM-positive (n = 14), IgG-positive (n = 23) and samples negative for both IgM and IgG-specific antibodies against RVF virus (n = 19) were tested using the serum neutralisation test (SNT). Sera from IgM-positive (n = 14) and negative (n = 20) animals were also tested by a TaqMan polymerase chain reaction (PCR). On the affected farm, 7% (16/233) of the cattle were IgM-positive and 13.7% (32/233) IgG-positive at the first bleed and 2% were IgM-positive at the second bleed, whilst the number of cattle positive for IgG-specific antibodies increased by 21.3% compared with the first bleed. Only 1.4% of sheep were positive for both IgM and IgG antibodies at the first collection; at the second bleed, IgM-positive cases decreased to 1.2%, whilst IgG-positive cases increased to 2.4%. Whilst no IgM-positive cattle were found on the neighbouring farm, 5.5% of cattle were IgG-positive. The SNT confirmed most of the ELISA results, whilst PCR results were all negative. Although serology results indicated virus circulation on both farms, the negative PCR results demonstrated that the animals were not viraemic at the time they were sampled. The movement of infected mosquito vectors by wind over long distances into a low-lying area that favoured their breeding on the Bela-Bela farm may have led to an outbreak of the disease there, but the reason for the low level of virus circulation amongst susceptible animals remains unclear. Rift Valley fever (RVF) is an acute mosquito-borne viral disease affecting mainly ruminants and is characterised by high rates of abortion, neonatal mortality, necrotic hepatitis and a haemorrhagic diathesis. The disease is more severe in young animals than in adults, and sheep and goats are more susceptible than cattle (Coetzer 1977; Gerdes 2004; OIE 2008). Evidence of RVF infection has also been reported in African buffalo and other wildlife species (Evans et al. 2008; Gonzalez-Scarano, Endres & Nathanson 1991). Rift Valley fever is a zoonotic disease and although influenzalike symptoms are normally experienced, haemorrhagic fever, encephalitis and death have been reported in humans (Kallio-Kokko et al. 2005). It is a notifiable disease in terms of the South African Animal Disease Act, but not a controlled disease. Therefore, it remains the responsibility of the animal owners to vaccinate their animals to prevent losses. The disease is caused by the RVF virus (RVFV), which is taxonomically classified in the genus Phlebovirus of the family Bunyaviridae (Bishop & Shope 1979; Bouloy 1991). Based on clinical manifestations and symptoms, RVFV is placed in the group of Ribonucleic acid (RNA) viral haemorrhagic fever (VHF) agents. The group of VHF agents also includes ebolaviruses, marburgviruses, the Lassa virus, Crimean-Congo haemorrhagic fever virus, yellow fever virus, Dengue virus and hantaviruses (Bouloy 1991; Pépin et al. 2010). Rift Valley fever is transmitted by mosquitoes, but biting flies feeding on viraemic animals could play a role in the mechanical dissemination of the virus during outbreaks (FAO 2003; Swanepoel & Coetzer 2004). Animals infected with RVFV develop antibodies within 3-5 days of infection, thus the detection of antibodies is one approach to determining animal exposure or the antibody status of a herd against RVF (FAO 2003). Infections can also be demonstrated using virus isolation and the detection of viral nucleic acid in whole blood, serum or organs (Pestana et al. 2010; Viljoen, Nel & Crowther 2005). Rift Valley fever outbreaks were first noticed and recorded in exotic sheep breeds in the Rift Valley of Kenya between 1910 and 1915, but the causative agent was only identified in 1930 (Findlay & Daubney 1931). The disease occurs when conditions favour the breeding of mosquito vectors (Andriamandimby et al. 2010; Sall et al. 1998). Large outbreaks with a significant health and socio-economic impact have historically been restricted to East and South Africa (SA). More recently, the disease has also been reported in livestock and humans in the Middle East (Clements et al. 2007; FAO 2003; OIE 2010; Sall et al. 1998). Apart from serious consequences for human and animal health, RVF epidemics also affect the international livestock trade (Clements et al. 2007). In endemic areas, epidemics generally occur after heavy rain (Andriamandimby et al. 2010) with flooding, but outbreaks have also been reported after no rain has occurred (Coetzer 1977). Over the years, several large outbreaks have occurred in South Africa, the first recorded and confirmed being in 1950. In 1974 and 1975, South Africa experienced a second big epidemic of RVF in sheep and cattle, which was preceded by wet conditions that favoured the breeding and subsequent increase in the mosquito vector population (Coetzer 1977; Coetzer & Ishak 1982; Swanepoel & Coetzer 2004). 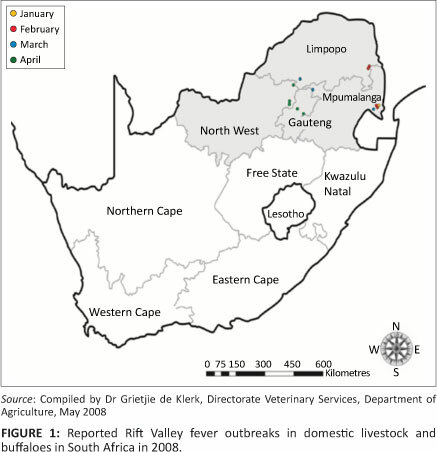 In 2008, the South African Veterinary Services, Department of Agriculture, Forestry and Fishery (DAFF) reported 13 outbreaks of RVF that occurred from January to June (Figure 1) and affected cattle, goats, sheep and African buffaloes in four neighbouring provinces of SA, namely Mpumalanga (4), Limpopo Province (3), Gauteng (3) and North-West Province (3) (OIE Ref: 7083, Report Date: 27/05/2008). In 2009, outbreaks of RVF were reported in KwaZulu-Natal. In contrast to the widespread epidemics of 1950-1951 and 1974-1975, the 2008 and 2009 outbreaks were limited to certain parts of SA. A third large epidemic occurred in 2010 (OIE 2010), affecting the eastern Free State province, areas of Northern Cape, Eastern Cape, Gauteng, and Mpumalanga provinces and the Western Cape. Domestic livestock (sheep, cattle and goats) as well as different wildlife species were affected (OIE 2010). In humans, there were 1588 suspected cases, of which 237 were laboratory confirmed and 26 were fatal (Paweska et al. 2010; Pépin et al. 2010). In March 2008, the Section of Pathology, Department of Paraclinical Sciences, Faculty of Veterinary Science (FVS), University of Pretoria (UP) received seven dead calves from a farmer in the Bela-Bela district, Limpopo Province (LP), SA. The post-mortem findings indicated infection with RVFV. The extent of the outbreak was investigated to determine the spread of the virus within the herd on the index farm as well as amongst cattle on a neighbouring farm. In March 2008, the Section of Pathology, FVS, UP received seven dead calves from a farmer in the Bela-Bela district of LP. Results of macro- and histopathology indicated infection with RVFV. Serum samples were then collected on the affected farm and a neighbouring one by the regional State Veterinarian and veterinary students of the FVS. The affected dairy farm applied an intensive farming system, with 300 Holstein Friesland cattle (including 40 calves) as well as 200 Pedi sheep. The calves were kept in cages inside a barn. The cages were raised above the ground and were positioned in such a way that the afternoon sun shines into the cages through the only opening in the building. The lights in the building were kept on during the night. The sheep were kept outdoors in the same vicinity, in cages about 200 m away from the calves, and the cattle about 100 m away, forming a triangle. All the calves that died were born on the affected farm and there was no history of newly introduced animals. The farmer did not practise any RVF vaccination programme. Seven of the calves were found dead one morning, after they had shown no signs of illness, having drunk their milk the previous evening. None of the other animals showed clinical disease, there was no visible drop in milk production and no abortions were reported. The geographical coordinates of the farm in the Bela-Bela district where the outbreak occurred are: E 28°19'28" and N 24°51'10". Approximately 1 km from the area where the cattle and sheep are housed is a low-lying area with a stream that flows from Klein Kariba, a small holiday resort close to Bela-Bela. This swampy area has dense plant growth with a lot of reeds. The neighbouring farm is in the same vicinity and a tarred road separates the farms. There are no other farms or other cattle close to the affected farm. None of the farm workers who assisted in the transport of the dead animals showed any clinical signs of RVF. The farmer, however, became very sick, showing influenza-like symptoms. The vegetation of Bela-Bela consists of grassland and trees, which is generally referred to as bushveld. Rainfall data in the area indicated that the rainfall for January 2008 was more than 100 mm above the average monthly rainfall, whilst rainfall in February was below the average and rainfall in March was normal for that time of the year (South African Weather Services). Blood samples were collected on two farms in the Bela-Bela district in LP, from animals of both sexes and different ages. During the first collection, which took place on 19 and 20 March, blood samples were taken from 77.7% (233/300) of the cattle and 36.5% (73/200) of the sheep on the originally affected farm and 55 blood samples were taken from cattle on a neighbouring farm. To evaluate sero-conversion as well as active infections, samples were collected 8 weeks later from 78% of the cattle (234/300) and 42.5% of the sheep (85/200) from only the affected farm. The second collection took place between 13 May and 16 May. The serum was separated after the blood had clotted and serum samples were labelled or identified according to the animal number, species and the farm on which they were collected. All the samples collected were tested using an Immunoglobulin M (IgM)-capture Enzyme-linked immunosorbent assay (ELISA) and an indirect Immunoglobulin G (IgG)-ELISA supplied by the Special Pathogen Unit of the National Institute for Communicable Diseases - National Health Laboratory Service. Based on ELISA results, 37 positive and 19 negative samples were selected and tested with the serum neutralisation test (SNT). In addition, selected ELISA IgM-positive sera (n = 14) and sera negative for both by IgM and IgG ELISA (n = 20) were tested by a TaqMan reverse transcription polymerase chain reaction (PCR) assay. The sera were first inactivated at 56 °C for 30 min in a water bath before performing the ELISAs. The IgM-capture ELISA was conducted following the procedures described by Paweska et al. (2003). For detection of IgG-specific antibodies against RVFV, a recombinant nucleocapsid IgG indirect ELISA was used, following the protocol established by Jansen van Vuren et al. (2007). The raw optical densities (ODs) were converted to positive predictive (PP) values using the formula as described by Paweska et al. (2003). Sheep sera that produced PP values > 8 PP and cattle sera that produced PP values > 14.3 were considered to be positive; PP values below these values were considered to be negative (Paweska et al. 2003). The SNT was done according to the OIE Terrestrial Manual (2008) and slightly modified to the Standard Operating Procedures (SOP) of the Virology Section of the Department of Veterinary Tropical Diseases (DVTD). The test was performed in 96-well microtitre plates and a vaccine strain (Smithburn) of RVFV (obtained from Onderstepoort Biological Products, Ltd) was used as neutralising antigen. Briefly, 2-fold dilutions of the serum were prepared (1:2-1:64) in duplicate on the microtitre plate and 100 μL of each dilution was used. The RVF neutralising virus with a titre of 104.6 TCID50/100 μL was diluted in MEM containing 5% foetal calf serum to provide a virus concentration of 100 TCID50. A volume of 100 μL was added to each well of diluted test serum. To determine if the correct concentration of the virus had been used, a series of 10-fold dilutions of the virus (10-1-10-5) was prepared and tested in triplicate. The plates were incubated at 37 °C for 1 h in an incubator containing 5% CO2 A volume of 80 μL of Vero cells at a concentration of 480 000 cells/mL was added to each well of the microplate including the virus controls, followed by incubation at 37 °C in an atmosphere containing 5% CO2 to allow virus neutralisation. The monolayers were examined daily from day 3 until the control dilution of 10-2 showed 50% CPE. Evidence of CPE was determined by using an inverted microscope and the results were recorded as the last dilution where no inhibition of CPE of the virus could be seen. Viral RNA was extracted from 140 μL IgM-positive sera and those sera negative for both IgM- and IgG-specific antibodies. The QIAamp®; Viral RNA Mini kit (QIAGEN, Germany) was used according to the manufacturers protocol. The extracted RNA was eluted in 60 uL of buffer AVE, obtained from the kit, and stored at -20 °C until use. One RVF positive sheep serum from a previous study was included in the extractions. This serum had been inactivated and stored at +4 °C for more than a year. The TaqMan Reverse Transcriptase Detection PCR (RTD-PCR) assay was carried out as described by Drosten et al. (2002) using the LightCycler®; RNA Amplification kit HybProbe®; (Roche Diagnostics, Germany) and the LightCycler®; instrument (Roche). Amplification was carried out in a total volume of 20 μL reaction mixture containing 5 μL of the target virus RNA or the in vitro transcribed RNA standards, 1 μM each of the sense (RVS) and antisense (RVAs) primers, 1 μM of probe (RVP) and 5 mM MgCl2 (Drosten et al. 2002). The primers that were used target a 94 base pair region of the G2 gene of the M segment of the RVFV. The sequence of the sense primer (RVS) is 5' AAAGGAACAATGGACTCTGGTCA 3' (349-371) and of the antisense primer (RVAs) is 5' CACTTCTTACTACCATG TCCTCCAAT 3' (443-417). The sequence of the TaqMan probe (RVP) 5'- nuclease probe labelled with 6-carboxyfluorescein at the 5' end and with 6-carboxy-N,N,N',N'-tetramethylrhodamine at the 3' end is 5' AAAGCTTTGATATCTCTCAGT GCCCCAA (388-416). The cycling profile was: reverse transcriptase at 45 °C for 30 min, initial denaturation at 95 °C for 5 min, and 45 cycles at 95 °C for 5 s and at 57 °C for 35 seconds (Drosten et al. 2002). Fluorescence was read at the combined annealing-extension step at 57 °C. The difference in the proportions of animals positive for IgM or IgG between the two bleeds was compared using the Chi-square test (Epi Info 3.5, http://www.cdc.gov/epiinfo). No physical or physiological harm was done to animals. Blood was taken from animals by a state veterinarian according to a standard SOP. The protocol for this research was approved by the Animal Use and Care Committee of the University of Pretoria. Of the 233 cattle sera in the first collection on the affected farm, 7% (16/233) were positive for IgM-specific antibodies and 13.7% (32/233) for IgG-specific antibodies. Of the cattle that were IgM-positive on the first collection, 56.3% (9/16) were also IgG-positive. During the second collection on this farm IgM antibodies were found in 2.1% (5/234) of cattle sera whilst 80% (4/5) of cattle, initially IgM-positive, also tested positive for IgG antibodies. There was an increase of IgG-positive cattle from 13.7% to 35% (82/234) between the first and second collections. Of the 73 sheep bled, only one tested positive for IgM antibodies and another sheep for IgG antibodies during the first bleed. On the second bleed, again only one (1/85) sheep (not the same animal) was positive for IgM antibodies whilst IgG antibodies were found in two other sheep (Table 1). Although no IgM-positive results were found in cattle sampled on the neighbouring farm, 5.5% (3/55) of them were IgG-positive (Table 1). Serum samples that tested positive for either IgM or IgG using the capture and indirect ELISAs were analysed by the SNT. Three samples that tested positive for IgM and one IgG-positive sample using ELISA (all had borderline PP values) tested negative by the SNT. Two samples that tested negative for both IgM and IgG-specific antibodies against RVFV using ELISA had serum neutralising antibodies of 1:10 and 1:20 (Table 2). All sera (n = 34) for sheep (n = 1) and cattle (n = 33) tested by the TaqMan RTD-PCR were negative except for the positive control sheep serum. To validate the assay, three standard controls were included: high positive, low positive and a negative control. The relevant controls were used during the laboratory analysis of the blood samples. Validated SOPs were used in the laboratory. Results obtained are trustworthy. Climate change and the presence of competent vectors in currently RVF-free areas suggest strongly that RVFV should be included amongst the most significant emerging viral threats to public and veterinary health (Martin et al. 2008). The outbreaks reported in 2000 in Egypt and in the Arabian Peninsula (Saudi Arabia and Yemen) (Shoemaker et al. 2002) have illustrated the potential of RVFV to spread to previously unaffected areas. An increase in the number of outbreaks as experienced in recent years in SA is also a major concern (OIE 2010). Outbreaks of RVF (n = 13) reported in South Africa in 2008 occurred from January to June in four provinces (Mpumalanga, Limpopo, Gauteng and North-West Province). All these outbreaks, including the outbreak at Bela-Bela described in this study, were isolated outbreaks that occurred within a radius of approximately 200 km. The outbreak in the Bela-Bela district affected one farm, with a herd of 300 cattle including 40 calves present on the farm. Seven of the calves died and macroscopic and histopathological findings obtained from five carcasses were in agreement with those previously described by Coetzer (1977) as characteristic for infection with RVFV. Deaths were only reported in those seven calves and no clinical disease, abortions or deaths were reported in adult cattle or sheep also present on the farm. A high mortality rate in calves was also described during the 1976 RVF outbreak in Sudan, where the mortality in calves was 40% (Eisa et al. 1980), whilst 10% -15% neonatal mortality was reported during the 1977 RVF outbreak in South Africa (Coetzer 1977). Factors determining the morbidity and mortality associated with an outbreak include the virulence of the virus, the presence of vectoring mosquitoes and the susceptibility of the vertebrates involved (Anderson & Peters 1988; Swanepoel & Coetzer 2004). The susceptibility of different hosts to RVF on the basis of experimental and field observations varies from extremely susceptible to inapparent infections (70% - 100% amongst lambs). Sheep and calves are highly susceptible to RFV virus (20% - 70%) (Anderson & Peters 1988; Swanepoel & Coetzer 2004). Blood samples were again collected from livestock within 8 weeks following a positive RVF diagnosis on the two neighbouring farms in Bela-Bela. Sera were tested for RVF-specific antibodies and the presence of viral RNA by RT-PCR. Since the animals were not vaccinated, the presence of IgG-specific antibodies is indicative of natural infection. These serological results suggest that cattle from the affected farm were infected but showed no clinical signs, in agreement with previous findings that most infections with RVFV may be sub-clinical in adult cattle (Eisa et al. 1980; Findlay 1931; Swanepoel & Coetzer 2004). Evidence of RVF infection in animals with no clinical signs of disease was also reported in Zambia by Davies et al. (1992). In their study, they established sentinel herds and sero-monitored them during an inter-epidemic period. Although they did not use an ELISA for detection of IgM antibodies, virus activity was demonstrated by means of the indirect fluorescent antibody test and the SNT. It would be difficult to speculate when the first infections took place at Bela-Bela. Diagnostic data that were sent to the OIE (OIE Ref.7083) suggests that the outbreak started on 1st March. The sera for this study were collected during the second week after the reported deaths (19 March), allowing sufficient time for sero-conversion to take place. In a study conducted by Morvan et al. (1992), IgM-specific antibodies to RVFV could be detected 6 months after natural infection, but only 27% (53/195) of these animals were IgM positive by the second month. Results obtained from experimentally infected sheep showed that the IgM-capture ELISA can detect IgM with 100% sensitivity 5-42 days post-infection, with the sensitivity decreasing to 12.5% 3 weeks later (Paweska et al. 2003), which clearly indicates the transitory presence of anti-RVFV IgM in infected ruminants. During the second bleeding on the affected farm, IgM antibodies were detected in 2.1% (5/234) of cattle sera. The difference between the results obtained during the two collections is not statistically significant (P = 0.089). According to the data above explaining the presence of IgM and the decreased sensitivity of the IgM-capture ELISA, the presence of IgM-specific antibodies against RVFV during the second bleed could be due either to persisting IgM from the first infection or IgM from a more recent infection during the 8 weeks after the first bleed. Results from sera collected during the second bleed showed that there was a statistically significant (P = 0.0057) increase in IgG-positive cattle cases from 13.7% (32/233) to 35% (82/234) on the affected farm. The increase in these antibodies can be explained in three ways. Firstly, all IgG-positive animals (13.7% [32/233]) from the first bleed should have remained positive; secondly, seven animals that were IgM-positive during the first bleed should have become IgG-positive and contributed 3% (7/234) to the increase of IgG-positive animals; and finally, the remaining increase of about 18.4% (43/234) of IgG-positive animals could have been from animals that tested negative for both IgM and IgG during the first bleed, but sero-converted in between blood collections. Blood collected the first time could therefore have been collected before detectable antibody levels. This possibility of antibody-negative results early in infection was also noted by Peters et al. (1989) as well as by Bird et al. (2009). The low number of sheep (1st bleed: 1/73 and 2nd bleed 1/85 IgM-positive; 2/73 IgG positive) that tested positive with the ELISA and all samples that tested negative with the SNT, as well as the absence of clinical disease in sheep, suggest that sheep in this study were not infected. This contrasts with published data indicating the high susceptibility of sheep to RVFV (Findlay 1931; Gerdes 2004). A possible explanation is that mosquito vectors circulating in the area were more host-specific and had a preference for cattle (Fontenille et al. 1998). No deaths or clinical disease were reported on the neighbouring farm. In addition, no IgM-specific antibodies against RVFV were found in sera collected on this farm, suggesting that no active infection had been present at the time. However, the presence of IgG in 5.5% of sera collected on the neighbouring farm in the absence of a vaccination programme indicates virus circulation during the period of this study. Serological evidence of infection with no clinical disease was reported in sheep and goats born after the 1997-1998 but before the 2006 RVF outbreaks in Kenya (Rostal et al. 2010). The SNT is considered by the OIE to be the gold standard for the diagnosis of RVF infections (OIE 2008). In this study, one cattle sample (1/23) that tested IgG-positive and three samples (3/14) that tested IgM-positive were negative using the SNT. These four samples were all weakly positive on ELISA. On the other hand, two sera (2/19) that tested negative on both ELISAs were weakly positive using the SNT. According to Paweska et al. (2003), results obtained by the SNT used for the diagnosis of RVF in field samples are not suitable for comparison with results from the IgM-capture ELISA. In experimentally infected and in vaccinated animals, the IgM-capture ELISA was more sensitive in the early stages of immunological responses than the SNT. Another explanation for the lack of agreement found between results obtained from the ELISAs and the SNT could be the interpretation of borderline readings for the ELISA. The specific animal population tested also influences the interpretation of the results obtained by the ELISAs and the manufacturer recommends that a re-adjustment of threshold values should be considered for each species (Paweska et al. 2003). No viral nucleic acid was detected using PCR in any of the selected IgM and IgG-positive or negative serum samples. The appearance of IgM-specific antibodies against RVFV 3-5 days after the onset of infection coincides with the cessation of viraemia (Bird et al. 2009; FAO 2003; Swanepoel & Coetzer 2004). According to the information sent to the OIE by the Directorate, Veterinary Services, Department of Agriculture, SA (OIE Ref: 7083), infection of animals at Bela-Bela started on 01 March 2008. The first collection took place 20 days later and by this time IgM-positive cattle were already IgG-positive. These facts explain the failure to detect viral nucleic acid by PCR, because the viraemia in the animals had already disappeared by the time of sampling. Although the PCR results were negative, the presence of IgM and RVF-positive histopathological and immunochemical findings (results not shown) in the dead calves indicated the recent circulation of virus. The outbreak occurred late in summer (March) when infected mosquitoes should still be present and could therefore be responsible for transmitting the virus between the two sample collections. How the virus was introduced onto the farm is not clear, but the possibility of low-level virus circulation in animals as described for endemic areas is a possibility (Swanepoel & Coetzer 2004). This could also be partially supported by the presence of IgG-specific antibodies against RVFV detected on the two farms. The 13 RVF outbreaks that were reported between January and June 2008 in South Africa occurred within a 200 km radius. The movement of mosquito vectors by wind over long distances might have introduced the virus to the farm (Sall et al. 1998; Sellers, Pedgley & Tucker 1982). This and the presence of a low-lying area on the farm with a stream nearby that favoured the breeding of mosquitoes may have led to ideal conditions for an outbreak to occur. The fact that mostly cattle sero-converted suggests a host preference of vectoring mosquitoes for cattle over sheep. In this study an isolated outbreak of RVF on a farm in the Bela-Bela area, Limpopo, South Africa is described. Seven calves died and no clinical disease was observed in either sheep or adult cattle on the affected farm. Also on a neighbouring farm no clinical disease was observed in cattle. The time line of the outbreak is described and its origin speculated on. It is concluded that the low-lying area on the farm with a stream nearby that favoured the breeding of mosquitoes may have led to ideal conditions for an outbreak to occur. The fact that mostly cattle sero-converted also suggests a host preference of vectoring mosquitoes for cattle over sheep. This work was funded by the DVTD, FVS, UP, Onderstepoort, Pretoria and contributions were also made by the FVS and the National Institute for Communicable Diseases, Sandringham, Johannesburg. There are no competing interests that the authors are aware of. The research was done as part of a Master's dissertation by L.P.M. (University of Pretoria). The practical work was done by him at the DVTD and NICD, under supervision of E.H.V. (University of Pretoria) and co-supervised by J.T.P. (National Institute for Communicable Diseases of the National Health Laboratory Service) and J.A.W.C. (University of Pretoria). E.H.V. (University of Pretoria) wrote and submitted the manuscript.